First Line: Home, my soul sighed. Fresh from solving a mystery on the moor, Mary Russell and Sherlock Holmes want nothing more than to rest and recuperate at home. But it is not meant to be, for mere hours after their return, a knock on their door brings yet another mystery to solve. This time the mystery involves the titled family who live in Justice Hall, a breathtakingly lovely home set in gardens modeled on Paradise. The mystery the Hughenforts want solved dates back to the First World War and rumors that still surround the death of Gabriel Hughenfort. The ominous clues lead Russell and Holmes on quite the chase, and there's a very real chance that they're being led straight into a killer's trap. 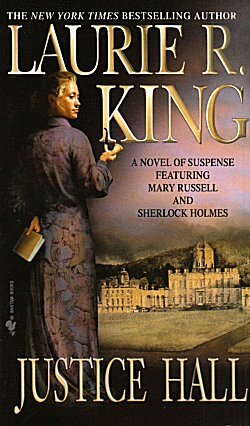 This well-paced mystery laced with perfect moments of subtle humor may not satisfy all readers of King's excellent series, but it did satisfy me. In many ways Justice Hall is a hymn of remembrance to those beautiful stately homes of England and to the hundreds of thousands of men that were treated as so much cannon fodder in the trenches of World War I. This is a period of history that fascinates me, which is why I enjoyed King's story so much. Mary Russell and Sherlock Holmes take the Hughenfort case on due to the reappearance of two characters from a previous book in the series, O Jerusalem. As the two get involved more deeply in their investigation, King cleverly plays on our innate prejudices against certain things to lead us astray. I hate to admit that it worked with me. A time or two the author's plot devices felt a bit contrived, but that really did not detract from the story for me. Justice Hall is a marvelous evocation of a time and a place, and it left me wondering-- as other books have-- when everyone will learn that no family on the face of the earth has a spotless lineage. We are all mongrels, and all the stronger for it. Aaauuugh! More books to read. Keep meaning to read more of this series, but when? The readers' dilemma. And we've been struggling with it for a lot of years!